AllergyEats, the leading guide to allergy-friendly restaurants in the United States, has just released its 2015 list of Most Allergy-Friendly Restaurant Chains nationwide. The chains on this prestigious list hold the highest ratings on AllergyEats’ website and smartphone app, per feedback from the food allergy community. AllergyEats restaurant ratings are based solely on how well restaurants have accommodated food-allergic diners, and not on other factors, such as ambiance, service or food quality. The Most Allergy-Friendly Restaurant Chains are grouped into two categories – Large (50 or more restaurants) and Small (under 50 restaurants). Results were based on diner feedback from the AllergyEats website and app through December 31, 2014. 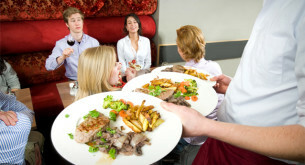 “The Most Allergy-Friendly Restaurant Chains list – and the growing number of AllergyEats ratings of all restaurants – helps the food allergy community make more informed decisions about which restaurants to visit and which to avoid, based on how well or poorly they’ve accommodated other diners’ food allergies,” Antico continued. Find the newest top 10 list here. How can you list PF Chang as allergy friendly? They have a clear disclaimer on their website that they use all the major known allergens (peanuts, tree nuts, eggs, fish, shellfish, milk, soy and wheat). This really needs to be omitted. My child is allergic to peanut, sesame and cashew, thinking that just ordering a dish that does not contain those ingredients we were safe. But there was apparent cross contamination. And, even though we ordered from there several times did not have a problem, this time we did. Even TCBY yogurt has signs about nut allergies. Please reconsider this listing it is definitely misleading. I agree with Chipotle, Outback and P.F. Changs… dont know the other places. We have a couple great local places (Greenbelt MD), Silver Diner has a lot of great GF options and they buy local. Love that. Busboys and Poets has a great menu, everything well labeled and the food is awesome. Ledo’s pizza has a great GF pizza (thank you). P.F.Chang’s may be allergy friendly, but year in and year out they are rated as having the highest sodium content of any chain restaurant. Weigh yourself the day you eat there and do so again the day after, scale don’t lie. You can taste the brine in everything. I concur with the Red Robin ranking. I started going there with my FA kids after reading your blog and we have not been disappointed! It’s nice to have a restaurant where we feel like we can all eat safely. Thanks! I notice most chains have improved since we started this food allergy journey 9 years ago. I was very happy with PF Chang’s until my son w peanut/treenut allergy had a reaction after eating there last year. Now, we stick to the other 4 on the list. We love Red Robin, it is the only place we eat out at. We have had one bad experience at the Riverside, CA Tyler mall location. I called corporate to let them know our experience and the representative may have been more upset by the experience than I was. She sent us gift cards and assured me that that store would be getting extensive training not only in handling allergies but also in sensitivity to customers with food allergies. The restaurants that I know on this list are latex safe- which means they don’t use latex gloves or utensils. Some states have banned latex from food businesses and some others have legislation in the works. This should be a criteria considered for “allergy-friendly” restaurants. Outback uses peanut oil now. This is new and started about 6 months ago. I’m not sure how accurate this list is and sure hope people aren’t relying on it! Although Red Robin may not use latex in the kitchen, they do have latex balloons all over the place. They hand them out to all the kids. We all know how kids are with ballons, so they are all over the place with them. I strongly disagree with the Red Robin rating my child has a severe latex allergy and cross reactive latex fruit syndrome. We can never step foot inside a red robin handing out balloons at the front door. Red robin to us is equal to a five guys for someone with a peanut allergy. I love P.F. Chang’s restaurant it has great food and knowledgeable staff. We have never had a bad meal or any reaction(my allergy are MSG and gluten). I think if you go to a chinese restaurant you should know that they do cook nuts and most chinese food have a lot of sodium in it. Also have eaten at Chipotle’s and Red Robin’s restaurant and had no reactions and the food was excellent. Agree with Red Robin, very good with multiple food allergies. Not so sure about P.F Changs, I would be too afraid of cross contamination with tree nuts. So many of their dishes contain nuts. Very bad experience at American Joes. And Not your average Joe has no clue about cross contamination. I’d have to disagree with Not Your Average Joes ranking since my son left in an ambulance from the restaurant last Monday. Ate a hamburger bun that they said was egg free. Asked three times before he ate the roll. They checked and deemed safe. Asked to check again when my son started not feeling well… Still no egg “we guarantee”.. But we can’t find ingredient list… Went back to kitchen again (at this time now dealing with manager and chef.. ). This time came out “can’t find ingredients.. And we know it doesn’t have egg.. But we can’t speak for bread companies cross contamination practices”…. My son and I left in ambulance.. My husband went to restaurant to pick up my car and went to to ask again for ingredient list.. Still can’t find.. After demanding it.. They finally produced and ingredient list CLEARLY stated contained eggs. Chipotle is not safe for gluten. Yes there is a process but someone else handles it to ring it up and the cheese is a huge source of contamination because they use gloved hands. They’ve also refused to test the cumin they use for peanut protein. So be careful. I have also went to Popeyes chain also. This is all anecdotal and usually based on the manager on duty. Whereas we have had some good experiences at Red Robin, we’ve also had some absolutely awful ones. We always go during slow times and always explain my son’s life-threatening allergy to dairy and ask for his burger to be cooked in a clean frying pan with no cheese and a plain bun. The last time we went, my son’s burger came out first with cheese and then with an obviously buttered bun. When we spoke with the manager a second time to reiterate our requests, he tried to argue with me that they don’t cook their burgers in frying pans, but my son would be okay if he ate a burger cooked on the same flat top they cook cheeseburgers and buttered buns. We were going about every other week, but we haven’t been back in over six months. Not all Outbacks use peanut oil. Ours doesn’t. Make sure to call. I agree with the Chipotle rating. My son loves this place! This is the one restaurant I feel safe taking my family to. I’m so happy it was in the top 10. I was surprised to see Red Robin and look forward to trying it out. PF Chang has a peanut-free, nut-free menu that they offer. We haven’t had any problems taking our allergic children there for lunch or dinner. I don’t know how people who are ANA can risk eating in a restaurant. Is it really worth it? These people are minimum wage and sometimes below that, they do not know very much about food or food labels or cc. And restaurants are pretty filthy. We have sat down in a restaurant with dairy ANA child and he got sick and coughing before any food was placed on table because table and chairs were so coated with allergen. Would not risk his life going into restaurant with so many unknown factors. Is it that important to eat out? NO! We used to love our local Red Robin, and they were awesome with my son’s dairy/egg/peanut/tree nut allergies. About six months ago, they switched to the corporate menu and website for allergen information (rather than the big book of allergens). It is awful now. The website allergy menu is inaccurate, the staff is mostly unhelpful (“We go by whatever the website says.”), and getting the manager to look at the packages for ingredients is like pulling teeth. We went from that being our favorite restaurant to a no-go. I commented on the Red Robin Facebook page and got a response there, but nothing has changed and I was offered nothing to keep my business. The changes are a big disappointment! All the meats in PF Chang’s are marinated in egg. The only thing my son could eat beside salad was a single dish of fish. Wouldn’t call that top allergy friendly. I agree with Chipotle, but not sure about the cumin now. Never tried the other places. It took me 21 yrs. to allow my child to eat out. Can you imagine never eating out because you are allergic to eggs, nuts, peanuts, fish, shrimp, sesame & God knows what else. But we have a place in Columbia called One Dish Cuisine which caters to all food allergies. Nothing is made in their Kitchen other than non allergic foods. We have also gone to Medieval Times in Arundel Mills & they have made her food separate from all others & had a wonderful time. I would love for her to be able to out more. Still leery of cross contact. I thought PF Changs is currently has a huge lawsuit against them because of their cross contamination of allergens? Gluten. Was not impressed by PF Changs. The waiter only told us that we’d be fine, that there were only a few nut items. We looked at the menu and saw at least 4 nut meals. It wasn’t until we told the waiter that we weren’t comfortable and were going to go elsewhere that he told us that they had a specific menu for allergies. I wasn’t comfortable, especially with the waiter. Red Robin is a nightmare for anyone with a latex allergy. I would not even be able to walk in the front door w/o going into full anaphylactic shock from the latex balloons all over their ceiling! If they are serious about being allergy friendly, let’s address the huge issue of latex allergies! Kudos for their other efforts, but with such an easy solution of removing the balloons, they do not deserve to be on this list. P.F. Changs has not been all that “friendly” on my visit. In their defense, they do have a separate menu and plates for people with allergies. However, they act fearful and they put on the invisible “rubber gloves” when dealing with you. It might have been safe but we felt ostracized. And, the allergy friendly menu is really small. They really need to give some sensitivity training to the wait staff about people with allergies. My son had a reaction at PF Changs after about the third time eating there. The owner was nice but got busy that night and likely didn’t ensure protocol was followed. can we please start adding FUNGI to the list of allergens? Mushrooms, truffles, truffle oil, blue cheeses… Etc. I had a meal at Maggiannos a couple of years ago. I told them of my allergy. I was assured there was no mushrooms in it. But I did not know it was prepared with truffle oil. I broke out in major hives everywhere. The following year, I ordered the same thing, told them of my allergies… This time the chef came out and told me about the use of truffle oil. He was able to prepare my dish with olive oil and no reaction. Love this site! My 14 yr old celiac son is crazy about GF menus at PF CHANG, Chipotle & Red Robin! We’ve been to these chains home in Minnesota, also in Florida, NY, and California. Great menus and selections … Awesome service! Also have had Legals in NY. Max also loves In & Out Burger, jimmy Johns subs, and Smash Burger! Red Robin is not always so allergy friendly. We stopped going there because my daughter had told them on 2 occasions that she is allergic to sesame seeds and both times we had 1 seed on the bread. We even asked not to toast it at all. Not so impressed. Red Robin is also good for food allergies because it has a great user friendly app that omits choices depending on your allergy! My son is ANA to dairy, egg, shellfish and some tree nuts. We do not eat out anymore. On a rare occasion we have gone to Outback and Maggianos successfully. However, it’s just not worth the risk and stress to eat out. I do wish we could eat out more. It’s very hard on me to never have a night off from cooking, but my son’s life is worth more. My hope is that one day there will be more allergy friendly restaurants available. We love Chipotle! We have also had great experiences at Burton’s. I would agree with previous comments regarding PF Chang’s. I would never go there with my egg/peanut allergic son. We have recently had great experiences at Applebee’s. They were very careful and both the manager and kitchen manager came to our table to confirm our order and ensure the allergies were noted correctly and food prepared safely. This was at two different Applebees in two different states! Red Robin sounds like it would be great from the interactive online allergy menu. You simply select your allergies and it spits out a menu that “should” be okay for you. We tried it out and lucky for us the head cook has a kid with allergies. He came out and verified the allergies and one is beef. He looked at us like we are crazy! He told us he has not and will not let his child eat here due to his allergies and assured us that anything we order would have beef on or in it based on how the kitchen works. He did end up making something off the menu complete and it was a deli sandwich with fries because they have a dedicated fryer for the fries. I was really disappointed at the allergy friendly perception that is not a reality for is. They do offer chicken, turkey burgers and many more options that my son can have but they are all cooked on the same broiler conveyer belt that all the beef goes on. There was no other option! at PF Changs and Mellow Mushroom. What perplexes me is how everyone thinks Chipotle is so allergy friendly? Cross contamination of all kinds of allergens is completely unavoidable there. The servers are touching flour tortillas, handling several different spoons, use their hands (with same gloves on) to put various toppings on foods, etc… Plus, it is so busy there and the servers are trying to get everyone down the line with their food. This is no different than a salad bar where all kinds of ingrwedients cross contaminate. I absolutely disagree naming Chipotle a top allergy friendly restaurant. I would never let my celiac daughter ever ever eat there. She would be sick within minutes. My daughter has a peanut/tree nut allergy and had a bad reaction after eating at P.F. Chang’s 2 years ago. She ordered a dish that didn’t have either and we were re-assured that cross-contact wouldn’t occur in the kitchen. This obviously wasn’t the case for us and we don’t trust them and no longer eat there. It used to be my favorite place to eat but allergy safe- it is not. We just ate at PF Chang’s (Arlington, TX) last night for my birthday and inquired about their allergy menu. Our waitress asked us about what food allergens my sister is allergic to and we told her, nuts, shellfish, dairy, soy, and eggs. All she said was, “Everything then! She didn’t write them down the first time we told her and when she came back to get the orders, if we didn’t keep on repeating about her allergies, it would have been ignored. After she wrote it down the second time it was brought up, the manager came out and straightforward told us that even though our request was brought up, there is no guarantee that it will be honored because of cross contamination in the kitchen. There was no effort at all to accommodate the allergy requests. Thanks all for your comments. The restaurants do read the ratings for their units (locations), so, please be sure to rate your experience on the core site (www.allergyeats.com) so that they get this feedback – good or bad. Chipotle’s is one of the few restaurant’s I dare go to. I have wheat, oats, rye, barley, and soy allergies. I have never had a wheat (not just gluten) reaction there. At my local location I have to avoid the beans as the sofrita spoon must travel across them. I tried eating the beans one time right after the beans were changed out, but used the same spoon again. I did have a reaction that time. I was at a Chipotle’s in Virginia Beach that had the sofrita’s somewhere else on the line. I did not have a reaction to the beans that time. P.F. Changs is good when you only have one allergy. I am allergic to Wheat, Gluten, Tree nuts, peanuts, shellfish. The manager at the location I went to (Dedham, MA) told me that I could choose between four different dishes. This is because the gluten free dishes have some sort of fish sauce or peanut sauce for flavoring, and the vegan items (shellfish free) have nuts or a sauce with gluten in it. So, if you have a few allergies, I would suggest somewhere else. Hi Elizabeth – you can search the WDW section of allergyeats.com for the Greater Orlando area. Have fun! Why isn’t UNO Pizzeria and grill more highly recommended? They are by far the most allergy welcoming chain we ever visit. They even have an electronic screen in each lobby to check ingredients and their managers are clearly well trained and never treat you like you are from Mars. Elizabeth – all the ratings on AllergyEats are from food-allergic diners, like you, so the more who rate a particular venue – and rate it highly – the more likely a restaurant will appear on the “top” list. Be sure to rate the locations that you have visited. We ate at RedRobin a few times earlier without any issues. Dined at Red Robin in Deer Park IL on Nov 21st, 2015. Checked multiple times with the waitress about the ingredients and also looked up their allergen menu before ordering for my son. He has dairy, peanut, tree nut and shellfish allergies. He has a reaction after eating there. Had to give Epi-pen, call 911 and was taken to the ER.